This HiRISE image ( PSP_002728_1645 ) shows dunes on the floor of Herschel Crater. The steep faces ("slipfaces") are oriented downwind, in the direction of motion of the dunes. 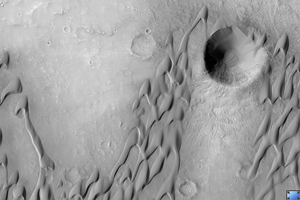 One feature of particular interest is the dune-free area downwind of the crater at the image center. Some sand has been trapped in the crater, but the crater prevents the dunes from migrating directly downwind. Sand dunes form naturally as a result of the transport of sand by the wind. The dunes in this image are somewhat crescent-shaped, but are being extended and distorted downwind and merging with nearby dunes; this complex behavior is common in dune fields on Earth. In the southern part of the image the sand lies in sheets rather than well-defined dunes. At high resolution, the dune surfaces are covered in small ripples and scallops, also shaped by the wind.